Looking for the right appliance to store your valuable bottles? 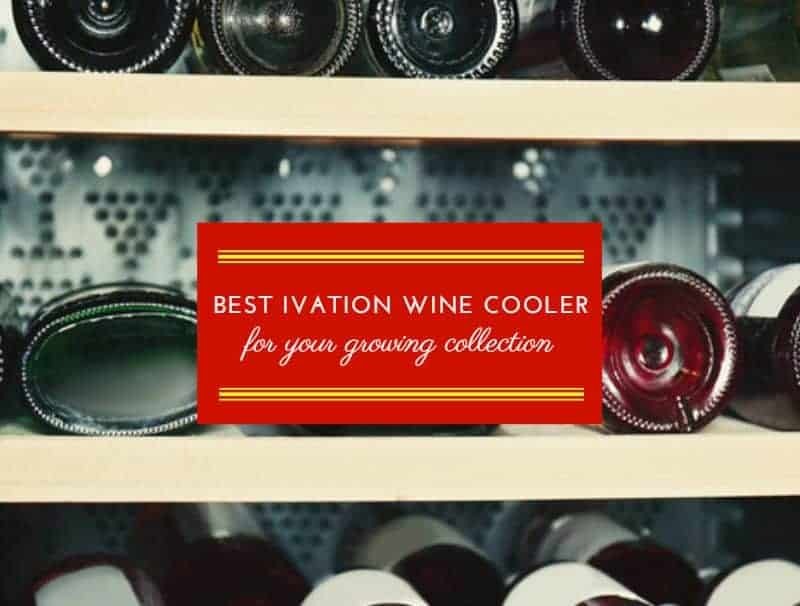 An Ivation wine cooler could be the right one for you. Producing a range of intuitive wine coolers for domestic use, the brand produces appliances of various sizes and with some great features. But why choose Ivation? What makes this brand better than the others? Read on to discover what Ivation wine fridges can do for you. If you're in a hurry then you can see our reviews summarized very concisely in the table below. You can click on the red links for prices. Read on for more detailed information and to see which models we like best. A quick search on the internet reveals dozens of results when looking for a wine cooler. With a wealth of products out there, it’s hard to decide upon a brand. But among the most popular stands Ivation. The manufacturer is renowned for making products that reflect the exact customer needs. Innovative features, quality, and ease of use are just a few factors that distinguish the brand. Their range of wine refrigerators respond to a specific demand. These coolers are dedicated to the occasional wine consumers who just started to grow their own collection of wines, but who don’t want to invest in a big and expensive unit. All Ivation models stand within an affordable price range and come as freestanding units. Small enough to fit on a countertop, these wine refrigerators have capacities between 8 and 24 bottles; the units can also be divided between single or dual zone. Other features include safety locks and other perks which most wine aficionados look for in a small home appliance. If you’re a newbie, you’re perhaps wondering how to decide between the wealth of options available. The features listed below are the most important to consider and they will determine your choice. Finding the right capacity for a wine cooler is often tricky, especially if you have just started your collection. A small appliance with a capacity of four to eight bottles may seem like a perfect choice. But we believe that investing in such a small wine refrigerator is hardly a good deal. A very small unit is ideal if you have a couple of very expensive bottles to preserve. But for a growing collection, we suggest investing in a unit with a capacity of at least 12 bottles. The 18-bottle units are perfect in our opinion. Small enough to fit on a counter yet spacious enough to accommodate a growing collection, these wine refrigerators offer the most in terms of value for money. If you’re serious about collecting wine, buying a spacious wine cooler could be more productive in the long run. Choose a unit with a capacity of at least 24 bottles to have plenty of space to grow into. Another important thing to consider is the style of the unit, but by style, we don’t refer to looks alone. Yes, aesthetic is important and investing in a unit that fits with your kitchen design is amazing. But you will also have to consider your available space. The smallest Ivation wine coolers are manufactured either as vertical or horizontal units to fit most needs; like you could expect, the capacity is not affected by any means. As for the aesthetics, some units present themselves as sleek, black cabinets. Others have stylish chrome trims that turn the appliance into a focal point. Do you like reds, whites, or both? Do you want to store your collection of bottles only or also chill the wine before serving? The answers to these questions can help you understand how many temperature zones you need. If you just want to store wine, regardless of its type, a single zone unit suffices. That’s because all the wine has the same storage temperature, which is around 55°F. Things get different if you also want to chill the bottles. In this case, a single zone unit is ideal if you like only one type of wine. But if you want to store both red and white, you’ll need a dual zone wine cooler. Ivation offers both single and dual zone units with similar capacities, so finding the right appliance for you should be easy. Another thing to consider is safety. Whether you want to restrict access to your wine because the bottles are very expensive or to keep kids away from booze, a lock could be essential. Our favorite wine coolers are those with a traditional locking mechanism because you won’t have to remember a code. However, if you’re worried about losing the key, a modern locking mechanism could be more appropriate. How the unit chills your wine also matters. There are two types of wine coolers, thermoelectric and compressor. The former uses a current to conduct warm air out of the unit to maintain the wine at a constant temperature. The latter uses a traditional compressor similar to those used in normal refrigerators. Thermoelectric units are ideal to store the wine but they struggle in maintaining the temperature constant in extreme environmental temperatures. Compressor units can seamlessly chill your wine and maintain the temperature regardless of how hot or cold is in the room. 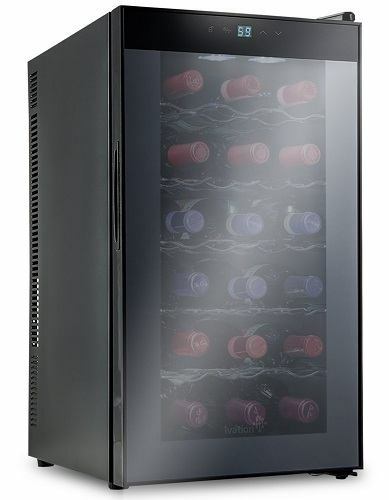 Ivation wine refrigerators come as thermoelectric units and are designed majorly for storage purposes. On a positive note, they are silent and emit low vibrations, keeping the wine sediment undisturbed. With this in mind, let’s see what option you have when it comes to actually choosing an Ivation cooler. This single zone cooler is the brand’s best-selling product due to its ideal capacity, sleek design, and size. Perfect to place on a countertop but also ideal to use as a freestanding unit anywhere in your home or office, this unit is designed to provide consistent temperature. Advanced thermoelectric technology ensures the temperature inside the cooler is maintained in the 55°F range, but you can change the climate according to the wine you enjoy best. The temperature range varies between 54°F and 64°F. Another amazing feature is the maintenance of a constant humidity which recreates real-cellar conditions on your countertop. Insulated with solid polyurethane CFC-free heavy foam, the unit stores your bottles in a protected environment. The Thermopane door is the cherry on the cake. Smoked and coated with an anti-UV filter, the door showcases your collection while keeping the bottles away from the harmful UV rays. Odor-free environment: designed to recreate cellar-like conditions in your kitchen, this unit provides an odor-free and climate-protected environment. Sleek design: presenting itself as a black cabinet, the unit is stylish and elegant. Exterior digital touch controls and an LCD temperature display make it easy to set the desired parameters. Minimal light: the Thermopane tempered glass door is smoked and coated with anti-UV agents. Blue LED light highlight your collection. Energy-efficient: the thermoelectric cooling system produces a negligible level of vibrations and has a whisper-free operation. The 18-bottle capacity refers to standard Bordeaux bottles. The internal configuration is flexible but the size of the bottles can adversely affect the capacity. Very similar with the single-zone 18-bottle wine cooler described above, Ivation 18-bottle dual zone is designed to preserve – and chill – both reds and whites. The unit is divided into an upper zone comprising two racks with a total capacity of six bottles and a lower zone with four further racks. Ensuring a stable temperature and ideal for all types of wines, the unit boasts a temperature range between 46°F and 64°F in the upper zone and 54°F and 64°F in the lower zone. Sharing similar characteristics with the unit above, this wine cooler comes with a solid Thermopane glass door which is tempered and smoked to prevent the penetration of the harmful UV rays. A CFC-free solid polyurethane foam ensures a constant humidity, preventing a dry-out of the corks. Sleek and stylish, the unit presents itself as a black cabinet that integrates into all interior decors. Modern chrome racks add a splendid minimalism to the interior and the 18-bottle capacity is calculated for standard Bordeaux bottles. Intuitive controls: an exterior digital control panel will allow you to set different temperatures for each zone and to switch between Fahrenheit and Celsius. Interior lighting: a soft blue LCD light with on/off switch is ideal if you want to showcase your most valuable bottles. Satisfaction guarantee: believing in the quality of its products, the manufacturer backs up this wine cooler with a 100% satisfaction guarantee. A helpful customer support can help with all your problems and doubts. Customizable interior: the wine cooler comes with removable chromed racks; this allows you to store larger bottles by compromising on capacity. The unit is louder than imagined; it’s more suitable to install in the kitchen than in a living area. If you’re unsure of how fast your wine collection will grow or if you have a restricted space, this 8-bottle wine cooler brings all the advantages of the 18-bottle units above in a versatile mini format. This wine refrigerator maintains the sleek lines of the units above and boasts a black finish throughout. Further smart features include an intuitive control panel for temperature control, and a smoked Thermopane glass door. Whisper-quiet operation and a low level of vibrations also ensure comfort and optimal storage. Coming in three designs, the 8-bottle unit is designed to adapt to the needs of most homeowners. The vertical unit presents four removable racks with a capacity of two bottles each. A horizontal unit is also available, presenting two racks with a capacity of four bottles each. Lastly, the manufacturer also proposes an elegant version which boasts a chromed trim around the edges of the glass and stainless steel and wood racks. Versatility: available in three styles to match your space or interior design, this 8-bottle wine cooler adapts to the needs of any homeowner. Rubber feet: designed as a countertop unit, the wine cooler is equipped with anti-slip rubber feet to protect precious surfaces. Adjustable temperature: ideal for either reds or whites, this unit has an adjustable temperature which ranges from 46°F to 64°F. Vibration-free: the thermoelectric system is designed with the wine sediment in mind and produces virtually no vibrations. This small unit struggles to maintain a constant temperature. Its performance drops if the room temperature is too warm. Another Ivation wine cooler with slightly different characteristics than the models above is Ivation Premium 12-bottle. The bigger brother of a similar 8-bottle unit, this wine refrigerator attracts with its sleek lines and elegant design. A black finish throughout is enhanced by a stainless steel trim around the thick Thermopane door. Made of smoked glass, the door is eye-catchy and showcases your bottles in the best of styles. The interior is equipped with superb oak wood shelves reinforced by a stainless steel structure. Temperature controls located on the upper side of the door are analog and very intuitive. The control panel also includes an on/off button for the soft blue interior LED light. Moreover, a small LCD display will always let you know what’s the temperature inside the unit. Like all Ivation wine coolers, this unit is thermoelectric; however, the temperature range is more suitable for reds and varies between 50°F and 64°F. Quiet operation: built with an energy-efficient thermoelectric cooling system, this unit is quiet and produces a low level of vibrations. Sleek door: stainless steel accents, an elegant handle, and a smoked glass door enhance the appearance of this wine cooler. Choice: the 12-bottle unit comes in three styles; an all-black design and a sleek unit with door lock are also available. Removable racks: this sleek unit comes with six oak wood shelves which are removable to maximize the internal space. The whisper-quiet operation is louder than expected. Since all Ivation wine coolers have surprisingly similar features, we thought to give you an alternative in case none of the units above convinced you. Our choice is the NutriChef 18-Bottle Thermoelectric Wine Cooler. 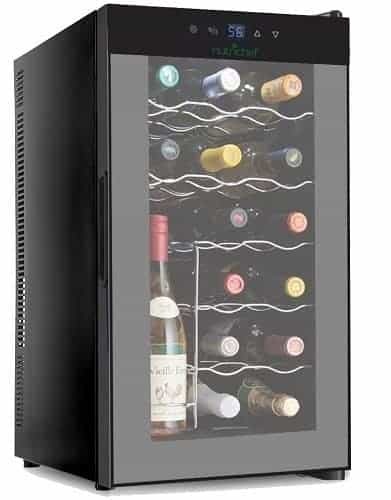 Offering a 50-liter storage capacity and holding up to 18 bottles, the unit boasts adjustable temperature controls, a built-in circulation fan and integrated LED lights. The temperature is displayed in either Celsius or Fahrenheit and the stand-alone unit is also equipped with a control panel lock feature. The interior boasts a sleek design and the capacity to store the bottles both vertically and horizontally. This makes the cooler ideal for preserving an open bottle or two. 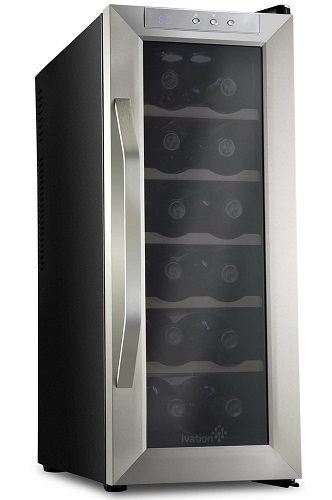 As for the exterior, this wine cooler has a black finish throughout, a built-in door handle and sturdy anti-slip feet. Energy efficient: an exterior touch control panel allows you to set and change the temperature without opening the door. Control panel lock: this feature allows you to lock the temperature to the desired parameters and lock it to prevent accidental changes. Decorative design: this stand-alone countertop unit boasts a decorative design which integrates seamlessly in most interiors. Quiet: thanks to an advanced cooling system, this unit is designed to keep your beverages at the right temperature without making noise. It is not possible to change the internal configuration of the racks. In choosing the best models from Ivation to cool your wine we followed a few rules of thumb that we use for our wine collections. First, we don’t consider thermoelectric units powerful enough to chill wines before serving. That’s why we wanted to select a unit that is ideal to store all types of wines. Second, we considered the capacity. We wanted a cooler small enough to fit on a countertop yet big enough to have some space to grow into. Lastly, we considered the design. Our top choice, therefore, is the Ivation 18-Bottle Thermoelectric Wine Cooler. This single-zone unit can keep all wines in the 55°F temperature range and at the same time, it offers plenty of interior space. The racks are removable, so you’ll even be able to accommodate non-standard bottles. A fairly quiet operation and a low level of vibrations will keep your beverage safe and the bottle sediment undisturbed. Yes, this unit has its limitations, as all thermoelectric wine coolers do. The interior temperature depends on the temperature of the environment and you will probably hear the fan every now and then. Yet, this wine cooler is quite exceptional and we truly recommend it if you’re after a compact, modern, and reliable unit.